How to Have a Budget Casino Night. Reserved for College Promotions and High School Grad./After-prom/Reunion events. Equipment only. Applicable to equipment-only rentals in which entire package consists of equipment only and no dealers or attendants. Free Dealer Orientation included. Click Here to go directly to normal casino pages. We hold a special place for institutions of learning. The fine folks in these organizations collaborate to work hard to educate our future leaders and they always deserve the chance to celebrate! 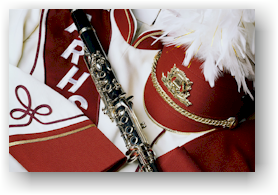 Whether you are planning a late-night after prom party or an after graduation event, we are available to fit your schedule. We have the after prom and graduation party games for your organization. Please visit our casino page for a once in a lifetime Vegas Night production. Also take a look at our complete entertainment list. 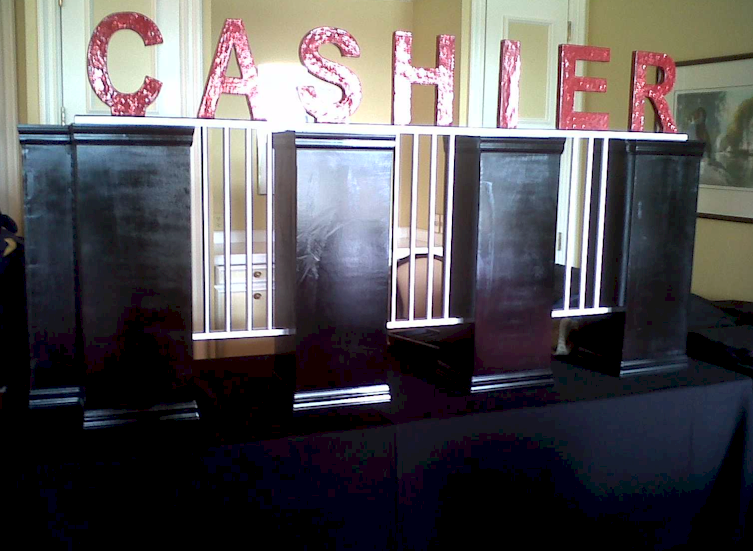 Also take a moment to visit our theme decorating section for a wealth of ideas for your after prom party decorations. 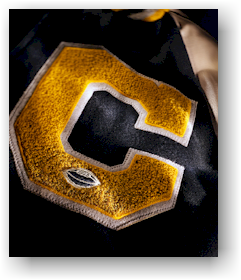 NEW - We just located a new supplier with thousands of spirit-related items. Article #1: Rules for self-run Casino Nights and Casino Night Parties Guide. Wondering how to hold a casino party? It is really quite simple. All you will need are games of chance, chips, prizes and committed students. Contact Amerifun first at (316) 755-6303 for all your casino games rentals at rates up to 50% off. We also offer low-cost economy games (cloths) for rent for $10 ($5 for schools) or purchase at a cost of $20 ea.. We also offer Chip Rentals to schools for the same same 50% off discount. If you are looking for low-budget options, you will want to consider the gaming felts (available in Blackjack, Craps and Roulette). First figure the number of students that you plan on attending and multiply by 50%. For corporate events, we typically multiply by 70% as the casino is often the main attraction. For school purposes we recommend 50% because you most-likely will want other entertainment on-hand such as inflatable games, live acts or other interactive activities such as a money booth or photographer. The answer is your desired number of player positions. So if you are expecting 100 students, then a casino to serve 50 players is ideal. This saves on budget even more! For High Schools: Begin recruiting teachers or parents for dealers. 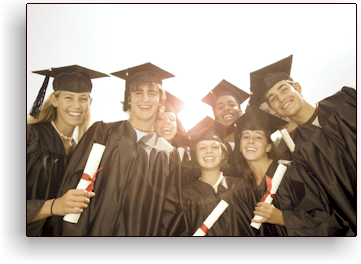 For Colleges: Begin recruiting sponsors, teachers or students for dealers. Regardless of who you have a dealers, we offer free dealer training with any game rental. If you are not renting any games from us and only are in need of guidance, please contact us at admin@amerifun.us and let us know which games that you need dealer instructions for and we will provide you with detailed rules for your selected games. Also please check out this page for a handy dealer checklist with some basic rules for a few popular casino games. Order some fun decorations, like some of those red and white-stripped Dealer Vests (use the link below to visit our party store for novelty dealer vests- type in "vests".) Also type in "casino" for some neat casino decorations. To offer you one convenient resource, we have taken the time to research some fabulous suppliers. A casino party is a fabulous school fundraising idea. Some tips for your school fundraisers: Begin soliciting donations or prize donations from parents, sponsors and contributors. Also recruit volunteers for help with decorations and dealers. Consider advertising your casino event. You can legally request suggested donations to enter (but cannot require). For more information on planning a school fundraisers please see our standard Fundraiser Pages. 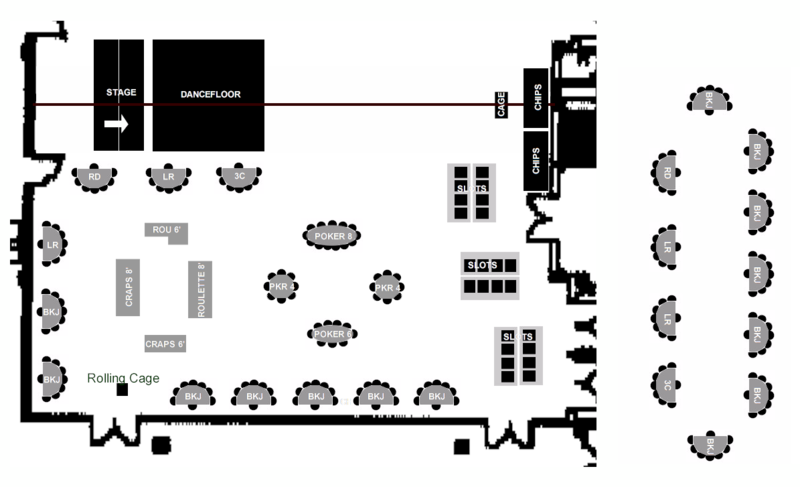 If you are using gaming cloths, line up some 4-6' banquet tables. Staple or duct tape the edges of the cloths to the underside of the tables to prevent slippage. We do offer Blackjack, Craps or Roulette cloths available for rent for $10 ($5 for schools) or for purchase for $20 ea..
For roulette, we do offer wheels for rent. If you prefer not to rent a wheel you can purchase a low-cost plastic wheel from a variety of sources. 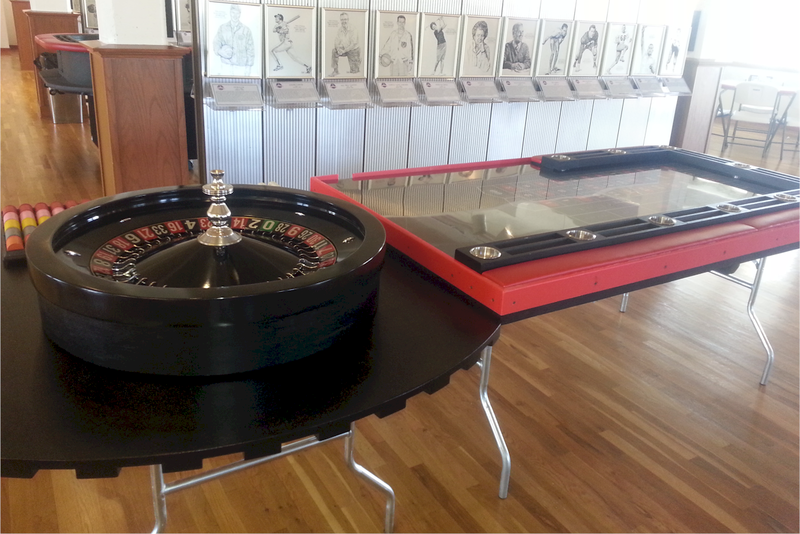 For craps, you will need some sort of table-top box for the dice to bounce off of. If you prefer not to rent a craps table you can build or construct your own box. The craps cloths are 36"X72" but the size of the printing varies- make sure to have your craps cloth in-hand before constructing a box. Allow a minimum of 4" all the way around the printing (the wagers). Here is a neat little set! 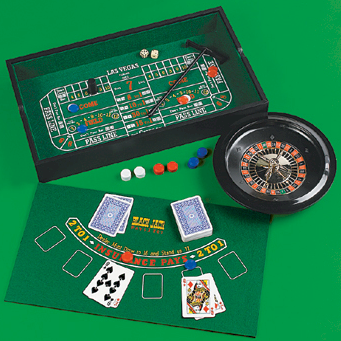 Just tell us that you want the "Novelty Casino Game Set"- reg. $40, sale $20.. Has a 10" roulette wheel, 2 balls, 2 dice, rake, card deck, 60 poker chips and a 20" x 11" x 3" case. Case doubles as a black jack, roulette or craps (can only play one at a time). Each game plays a maximum of six players. Arrange the tables in a pit with the dealer's backs all toward each other or along a wall. Click on the thumbnail below for a few ideas. You will want to print some Fun Money. Sign on to your favorite image software and create a quick, fun design. You can use teacher's or student's faces on the bills or other characters. You can fit four to six bills on a page. We recommend black and white copies on colored paper to save on cost. You want them to all feels like 'high-rollers'! We recommend printing denominations of up to $100,000.. you will need them!! Determine how much fun money that each guest will start with, let's say $10,000. If you had 100 guests, you would need 1000 bills to start, or about 20 pages. The evening-end redemption method that you use will determine how much more money that you will need. There are many redemption methods that you could use but we use a Raffle, Auction, Gift Shop or Giveaway as prize methods. If you are having an 'auction' or a 'gift shop' then you will need lots more money, if you are having a 'raffle' or a 'giveaway' then you will not need more money. It is a good idea to have as much fun money on hand as 10X the start amount per person for an auction or a gift shop, in varying denominations. For example, if you have 100 people that start with $10,000 each ($1,000,000) then you should have about $10,000,000 in fun money. Remember it is illegal to use any part of the design from US Currency unless the design is smaller or larger. Click here for more info. Decide on one prize method only, don't confuse guests with two many different prize methods. A good idea for additional prize methods is a series of prizes followed by a single grand prize. We use a Raffle, an Auction, a Gift Shop and a Giveaway and provide our dealers with the prize tools for evening-end redemption right at the table. This is a good practice to keep the cashier lines to a minimum. Click here for our prize methods. If you need chips only for your own tables, we offer premium gaming cheque (chips) rentals to schools for $37.50 per 1000 (delivery included). If you rent at least one game from us (chips included with our game rentals), the cost is or $25 per 1000 chips for your own games. If you wish to purchase your own chips there are many available sources. Plan on needing 300-500 chips for each blackjack table and the like. A minimum of 500 chips will be needed for the craps and roulette (or as many as 1000 or more). Look for three to five different colors. If you are following our example from above and are planning on starting each player with $10,000, then you will want to designate the colors as $25, 100, $500, $1000 & $5000 (don't bother with low denomination chips). For a great really low cost idea, try your local Dollar Tree Store for some great economical chips, they have them for $1 for 80 - this is the lowest priced chip we've seen (with maybe the exception of those red/white/blue plastic interlocking ones that you remember from your childhood around the kitchen table!). We have some great suppliers. Ask about good quality economy chips for sale for as low as 7cents each! We recommend hosting a casino for 3 hours with prizes afterwards unless you are having an all-night event. For a prime-time event, advertise your event from 7-10 or 8-11pm. Instruct your dealers to begin counting down their players at around 10 minutes till finish time. Go right into prizes after the gaming ends. If you are having an all-nighter make sure you keep your dealers in plenty of breaks to keep them fresh! Another great idea to finish off your all-nighter is to cook breakfast for the students a couple of hours before end time or before dawn. If your event is at the school you probably have a kitchen- turn those dealers into chefs! If your venue does not have a kitchen, full-service catering always available to fit your schedule. We hope the above article has been helpful and gives you some great ideas for your next school casino night party project. 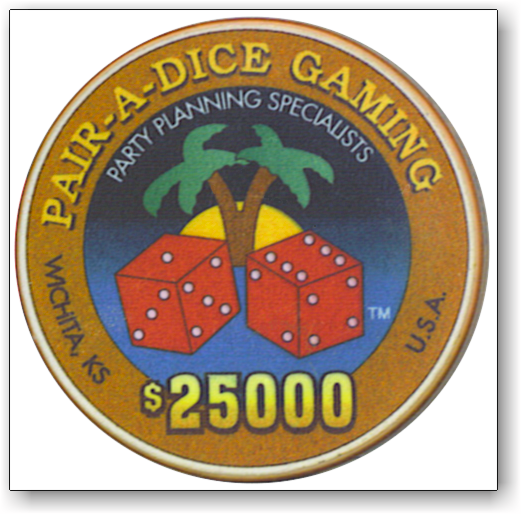 Casino Parties Wichita, Casino Wichita, Fundraiser Wichita, Party Games Wichita, Wichita Casino Party, Wichita Casino Parties, Wichita Casino, Casino Rentals, Poker, Texas Hold 'Em, Roulette, Blackjack, Craps, Let it Ride, Three Card Poker, Casino Supplies, Custom Poker Tables, Graduation Party, Prom Party. Graduation Party, Prom Party, Casino Parties Wichita, Kansas Casino Party, Casino Wichita, Wichita Casino Party, Fundraiser Wichita, Casino Theme in Wichita, Casino Party Rentals, Entertainment Wichita, Wichita Casino, Wichita Casino Rentals, Blackjack Wichita, Wichita Poker, Company Party Wichita, Company Parties Wichita, Corporate Party Wichita, Casino Kansas, Roulette, Blackjack, Craps 14', 12', 10', 8', 6', Let it Ride, Three Card Poker, Caribbean Stud, Casino War, Red Dog, Mini Baccarat, Pai Gow, Chuck A Luck, Color Wheel, Poker 6' & 8'.